I first remember reading about vimanas, i.e. highly advanced ancient Indian flying machines, in Chariots Of The Gods, the first international best-seller of the controversial author Erich Von Daniken. Down the years I have come across several other interesting references to vimanas elsewhere, too. 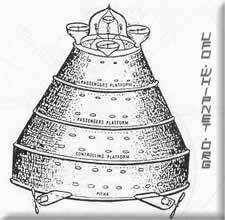 It wasn't , however, until I recently received an e mail from an Indian reader of my article Ancient Astronauts, that I recalled just how very intriguing these vimanas and, indeed, many other references to space travel and fantastically advanced technology in ancient Indian texts are. To this end, the following piece is intended to take a fresh look at vimanas and, moreover, explore the Indian ancient astronaut connection in general. It is generally reckoned that the present form of the great Indian national epic, the Mahabharata, dates from between the 4th century BC and the 4th century AD. According to Indian tradition The Mahabharata, a collection of around 80,000 couplets, was first gathered together by one Vyasadeva, possibly a incarnation of Vishnu. Vyasadeva's 's disciple Vaicampayana is said to have first recited The Mahabharata for the king Janamejaya some hundred years later. Very simply, The Mahabharata tells the story of the long war between the Kauravas and the Pandavas. This war was apparently willed by the ancient Indian Gods with the intention of easing the problem of over-population in the world. In his English translation of Krsna - The Supreme Personality of Godhead., His Divine Grace A. C. Bhaktivedenta Swami Prabhupada tells us that the Mahabharata was gathered together by the great sage Vyasadeva in order to bring Krishna consciousness to " those less intelligent ( like women, labourers and the mercantile class)". And further informs us that In the Mahabharata "Krsna is presented in His different activities". , and perhaps more importantly for us here, that the "Mahabharata is history.."
It is in the Mahabharata that we hear about Bhima who "flew with his vimana on an enormous ray which was as brilliant as the sun and made a noise like the thunder of a storm". And in the same great ancient Indian epic we also hear about the great warrior Arjuna's ascent to Indra's heaven. Importantly, Arjuna is, we are told, a mortal. However, during the telling of his particular adventure we are told of his ascent to heaven in a car that travels upwards to the clouds with a noise like thunder. Whilst travelling to heaven Arjuna apparently also sees flying cars that have crashed and are out of action and other flying cars that are stationary, whilst others fly freely in the air. The unknown weapon is radiant lightening, a devastating messenger of death, which turned all the relations of Vrishni and Andhaka to ashes. Their calcined bodies were unrecognisable. Those who escaped lost their hair and nails. Crockery broke without cause; birds turned white. In a very short time food was poisonous. The lightening subsided and became fine ash. Like Von Daniken says, It really is very difficult not to consider such provocative passages in the light of Hiroshima and Nagasaki. Could it really be possible, as Von Daniken infers in According To The Evidence, that the ancient Indian Gods held the terrible and awesome power of an atom bomb? And if they did, were such lethal weapons of destruction let loose on the earth in the dark and distant past, perhaps causing the a terrifying and ancient nuclear war? "At Rama's behest the magnificent chariot rose up to a mountain of cloud with a tremendous din." 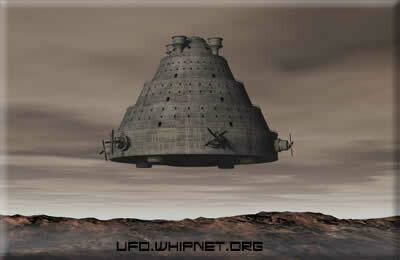 The tremendous noise apparently caused by the ancient Indian flying machines are certainly reminiscent of similar phenomena in the Bible and other ancient texts from around the world. Interestingly, in another of his books, The Gold Of The Gods, Von Daniken presents us with a photograph of an old Indian bas-relief which is, he tells us, a depiction of a vimana that was easily identified by Sanskrit scholars. 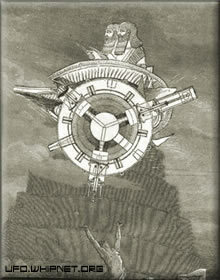 He presents the picture of this ancient Indian vimana, or flying machine, next to a prehistoric drawing found high up on a rock face in the Sete Cidades. In Daniken's opinion the Sete Cidades drawing is "identical in style and layout" with the ancient Indian bas-relief. In a similar vein to the above mention of awesome and devastating mention of weapons in The Mahabarata, The Ramayana also seems to make mention of such weapons, too. For instance in the tale of 'Rama and Sita' the king promises Rama that if he succeeds in bending a certain immensely powerful bow, he will have his daughter, Sita, the princess born from the earth. "Straight away the King gave the orders: five thousand well-built men strained to drag the eight-wheeled iron cart which contained the divine weapon. Try, commanded the devout king, and effortlessly Rama seized the bow and drew it. He bent it to such an extent that he broke it and the sound that the string made in breaking struck fear in everyone who witnessed it. My daughter, said the king, will be the prize won by your strength". When he begins his flight from the mountains, the tops of the cliffs break, the foundations of the mountains shake. Giant trees are stripped of their boughs and broken, a shower of wood and leaves falls to the ground. The mountain birds and animals flee to their hiding places. With burning tail he swings himself up over the rooftops and kindles vast conflagrations so that the tall buildings and towers collapse and the pleasure gardens are laid to waste. "Upon seeing the Visnudutas, Ajamila gave up his material body at Hardwar on the bank of the Ganges. He regained his original, spiritual body - one appropriate for an associate of the Lord. 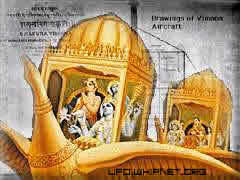 Accompanied by the order-carriers of Lord Visnu, he then boarded an airplane made of gold. Passing through the airways, he went directly to the abode of Lord Visnu." What I believe is especially fascinating about this particular passage is although it appears to talk of a spiritual journey by Ajamila, the journey itself is clearly based in the material world, with clear references to actual places and the like. Hence, for example, the mention of "Hardwar on the banks of the Ganges" and also the "airplane made of gold" that passes through "the airways". The text on page 140 of The Second Chance is, by the way, illustrated by a beautiful plate (plate no. 7) of Ajamila, now pure and fully Krsna conscious, boarding a "spiritual" airplane that will take him back to the kingdom of God. Finally, again in According To The Evidence, Von Daniken tells us that it is possible to read in the 'Rama and Sita' section of the Ramayana all about how the villainous Rawana kidnaps the beautiful heroine Sita in an aerial car that is like the sun. Rawana flies Sita in his aerial car that is like the sun high over woods, valleys, and high mountain tops. Hearing about the kidnapping of his lovely wife, Sita, Rama cries : " Fly out the aerial cars at once". And immediately he sets off and challenges Rawana to aerial combat. In the perusing battle to get Sita back, Rama uses an heavenly arrow to shoot down his enemy, who eventually dives into the depths. Rama manages to save Sita and she climbs into her husband's heavenly flying machine which at Rama's behest, rose up to a mountain of cloud with an enormous noise. Reading passages like this, can it really be possible that Von Daniken is right when he says that "Only an illiterate could overlook the fact that flying cars were described in ancient Indian texts"? Perhaps, all in all, the very least that can be said is that ancient Indian epics such as the Mahabarata and the Ramayana are certainly compelling reading for anyone interested in discovering more ancient astronaut connections in world literature.